You’ve heard it’s bad for your brain to cram for finals, but what should you do instead to get ready for semester exams? 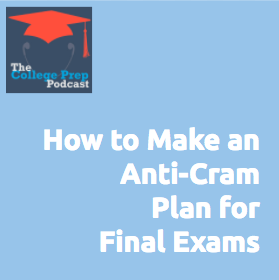 Make an Anti-Cram! plan, of course! How to create a final exam study plan that (hopefully) kicks cramming to the curb. If you’d like to follow along with Gretchen’s slides to her Master Class, here they are. Also, we ended up recording the Master Class as a Facebook live, so if you want to watch the original, check it out here. Finally, here is more information about Gretchen’s upcoming class for educators, The Art of Inspiring Students to Study Strategically.